Hearing difficulties can cause serious problems when it comes to safety in the home, so it's vital that the hard of hearing have the technology they need to ensure their safety. A great addition to any Wi-Safe2 alarm system for the hard of hearing, the Fire Angel Wi-Safe2 Low Frequency Loud Sounder for the Hard of Hearing W2LFS630 utilises low frequency sound to alert hearing impaired individuals to the presence of fire or carbon monoxide (CO). Low frequency sound is typically easier to hear for the hard of hearing. Because of this, the Wi-Safe2 loud sounder utilises low frequency sound to alert hearing impaired individuals to the presence of fire or CO in their home. The sound emitted is a 520Hz square wave and has a volume of 85dB (measured at 3 metres) to maximise the chance of it being heard. The sounder even features a light to indicate if either fire or CO has been detected when the alarm sounds. Wi-Safe2 alarms come together to create a network of smoke, heat and carbon monoxide alarms to ensure maximum safety in the home. 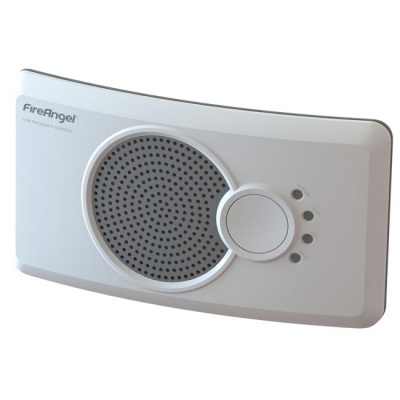 When one alarm is activated, all others in range will sound as will the receiver, providing you with total coverage of your home and protecting against these dangers in a comprehensive way. Up to 50 alarms can be linked together in a single network, giving you a fantastic level of safety even in large homes.